Brett Jones, daughter of Denby Fawcett of KITV and Bob Jones of MidWeek, poses with President Bush in Hanoi. 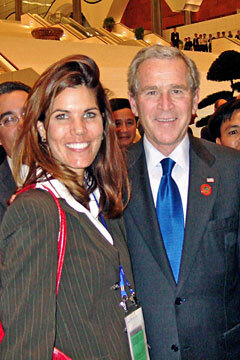 She directs humanitarian programs for USAID Vietnam and was borrowed by the U.S. Embassy to coordinate hotel space, meals, meetings and security issues for the Bushes' stay. President Bush kicks off an overnight visit to Hawaii this evening -- a stop that will last three hours longer than his first island stay in 2003 but lacks any public appearances or fundraisers. Bush, who is flying here from Indonesia, should arrive at Hickam Air Force Base after 6 p.m. He will be joined by his wife, Laura, and senior White House officials who are returning to Washington, D.C., from an Asia-Pacific Economic Cooperation forum in Hanoi, Vietnam. After Air Force One lands, the president and first lady will be greeted by Gov. Linda Lingle and Lt. Gov. James "Duke" Aiona, said Russell Pang, the governor's spokesman. Tonight, following a private, late dinner at an undisclosed location with Lingle and military officials, Bush will stay in military quarters. There were no planned public appearances by the president as of last night, officials said. Tomorrow, Bush will eat an early breakfast at Hickam with "troops from surrounding bases," said White House spokesman Blair Jones. The president will then be taken by motorcade to Camp Smith for a short briefing with Adm. William Fallon, commander of the U.S. Pacific Command, before returning to Hickam for the flight to Washington. Motorists are warned to avoid any side roads near Hickam and Camp Smith between 6 and 8 a.m. tomorrow because of possible delays from road closures, according to the U.S. Secret Service. Traffic on H-1 freeway should not be affected. Also tomorrow morning, the first lady will participate in a round-table discussion at Pacific Command to talk about military housing, quality of life and transitional and educational services provided to mainland families who are stationed here, officials said. Similar meetings are regularly held by her when she travels to other U.S. military bases, the White House said. The president decided to visit Oahu to recognize and congratulate Hawaii-based troops on his way back from an eight-day trip to Asia, Jones said. Throughout the 21-nation Asian summit, Bush conferred with leaders of China, Russia, South Korea and Japan to step up pressure to dismantle the nuclear programs of Iran and North Korea. In both cases he found progress agonizingly slow, though there was more evidence of unity in dealing with the North. Russian and American officials also celebrated an agreement to allow Russia to enter the World Trade Organization after 10 years of stop-and-go negotiations and talks that began shortly after the collapse of the Soviet Union. Yesterday, Bush visited the Vietnam Stock Exchange, striking a gong to open the day's trading, and offered encouragement for the country's battle against bird flu and other public health challenges such as HIV/AIDS. But to Bush's dismay, he was unable to deliver a promised agreement on normal trade relations with Vietnam, whose economy is the fastest growing in Asia. Later, in Indonesia, the world's most populous Muslim country, Bush was received by thousands of protesters who bashed America's policy in the Middle East and wars in Iraq and Afghanistan. Under increased threats of an attack by al-Qaida-linked groups, Bush met with President Susilo Bambang Yudhoyono before leaving for Hawaii. Bush came to Oahu during his first term as president in October 2003 and attended two GOP fundraisers and visited the USS Arizona Memorial, the USS Missouri and Pearl Harbor Elementary School -- all in 12 hours. Bush's presence at a $2,000-per-ticket fundraiser dinner at the Hilton Hawaiian Village hotel drew more than 500 demonstrators who lined Kalia Road holding signs protesting his policies, mainly the decision to invade Iraq.